Last week we were very lucky to be invited along to Motherswork to be introduced to Oribel- an innovative brand of baby accessories and toys that originates in Singapore. It's not often that the suggestion of MORE toys and stuff to squeeze into our 1200 sq.ft apartment gets me genuinely quite excited - granted not as excited as my kids though, because you know, that's a big ask - but honestly Oribel might just be a brand I can get on board with. For a start there's minimal plastic involved which I love. When I had Finn I was determined that the only toys we'd have in the house would have as little plastic and chemical based paints/dyes as possible. Obviously that lasted right up until he started to get interesting and other people kindly gifted him toys to enjoy, but I still hark back to that parental dream occasionally. Usually right when I'm tripping over bits of mass-produced plastic with flashing lights and headache inducing sirens. You know how it is. Oribel, I'm relieved to say, are on board with using as many natural materials as possible, along with easy on the eye colours so the eco-Mama in me feels like I'm slightly back on track to achieving goals. Second big win for me- no floor space required. Well, no more than your kiddie already takes up. The toys stick to the walls and are designed for vertical play (Vertiplay to use the correct terminology). This is a pretty great idea for numerous reasons, the main one being no more stuff on the floor to trip over/vacuum up "accidentally". Plus, not only do the toys require as little real estate in your home as is physically possible, but the same principle applies to the traditionally bulkier baby/toddler apparatus- activity stations, teeny tables and highchairs. Everything is designed with apartment dwelling modern families in mind from ensuring every product has multiple purposes to their super compact storage. A third sprog is not currently on the cards, but if he/she was to be, I know exactly who I'd be going straight to for baby-stuff. So now that we've established that I'm pretty enamored by this brand, what do the true critics of all things kiddie orientated think? Did you enjoy the Motherswork and Oribel party? C: I liked the story time with the baby owls, soooo cute!!! F: I just liked playing, and the donuts. And the cakes with the flags in them, they were deeelicious. And Finn, what was your favourite toy you saw? F: Definitely the tree one, the one I have in my bedroom. Yes, that one. It's really cool isn't it? And the train, can I have the train too? It's in the box still Mama.. oh and I liked the rockets too, but they were on the high shelf and you said no so shall I ask Daddy? C: Well I like my owl (the balloon) but it's not a toy. And it's running out of air. I liked Foxey as well but we gave her to Austin (a friend) because she loves Foxey's doesn't she Mama? So on the Finn and Clara scale of good, how many thumbs up are we going to award Oribel? F: (sticking two thumbs up) TWOOOO!!!!!!! C: (waving both hands manically in my face) why just thumbs Mama? I have fingers too you know! See! Look! Thanks Finn and Clara, I guess that's as good as feedback gets from a 5 and 3 year old! Want to get your hands on some Oribel? 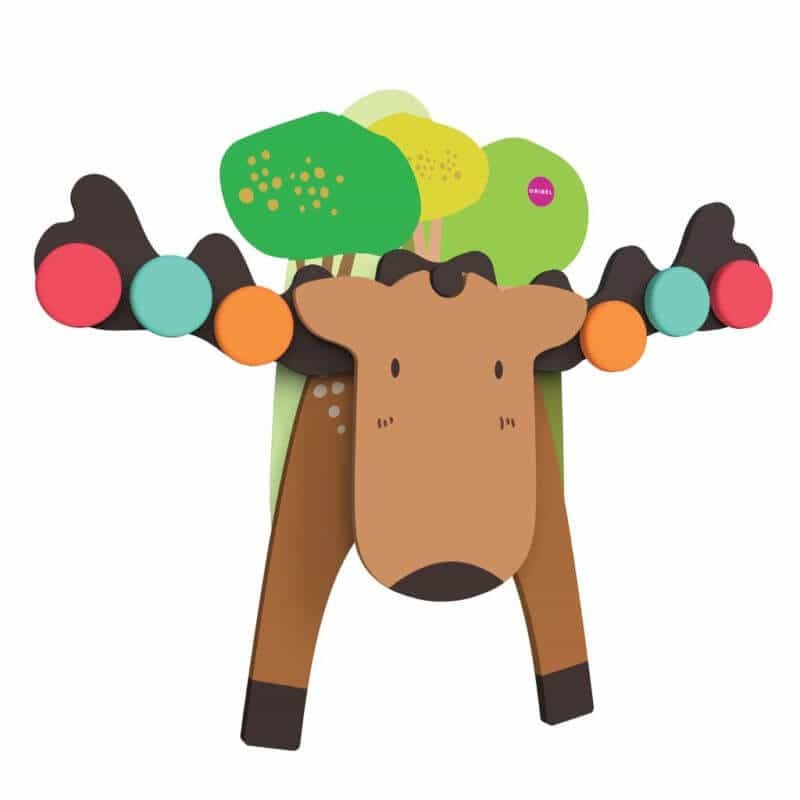 Enter the giveaway below to win a Vertiplay Goofy Moose (as shown below)! GOOD LUCK! The winner will be announced across social media and will be contacted directly. The competition runs from midday on the 26th April 2017 until midnight on the 7th May 2017 Singapore time. This giveaway is possible thanks to the kind gift of a Vertiplay Goofy Moose from Oribel, however the giveaway is in no way endorsed by Oribel, Motherswork or any other partners. The competition is open worldwide and the winner will be selected at random via Rafflecopter. The prize must be claimed within 48 hours of notification of the winner, after which time it will be raffled again. Each entrant has a maximum of three entries to this competition, however multiple family members may enter. Your personal data will only be used for the purpose of this giveaway and will not be passed to any third parties without your permission.